Feta cheese is not lactose-free but it contains less lactose than other dairy products and typically is consumed in small portions, limiting the amount of lactose consumed. Feta cheese is a cultured cheese that contains enzymes that help break down the lactose naturally. If you’ve been diagnosed with lactose intolerance, ask your doctor before consuming the cheese. Although lactose-intolerance symptoms do not cause any harm to the body, the reactions are uncomfortable and could be embarrassing. Lactose is a naturally occurring sugar found in dairy products. Lactose is a complex sugar that cannot be absorbed into the bloodstream in its natural state. Like most sugars, lactose requires interaction with an enzyme, lactase, to simply it into glucose and galactose. Once broken down, it is digested and absorbed by the body. If you cannot digest lactose because you’re deficient of lactase, you’re considered lactose intolerant. Everyone slows down the production of lactase as they age, but only people who develop symptoms are diagnosed as lactose intolerant. 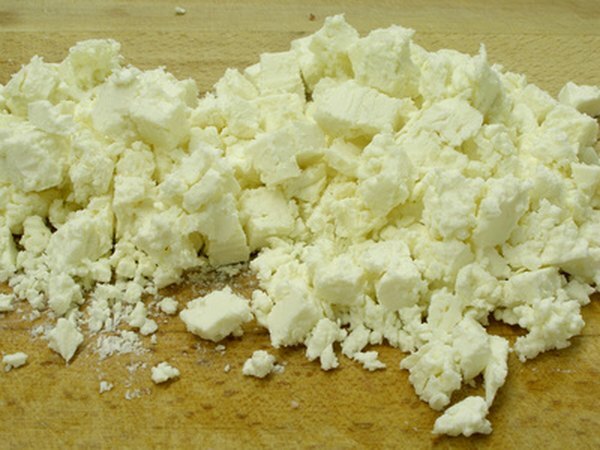 Feta cheese, like other cheeses, is made by adding certain enzymes to goat's, sheep or cow’s milk. The enzymes convert some of the lactose into lactic acid, giving feta cheese its sharp and bitter taste. Lactic acid is easily absorbed into the body, but the remaining lactose in the feta requires some lactase from the body to digest it. Most people who are lactose intolerant still produce a certain amount of lactase and are able to digest feta cheese. Feta cheese also is consumed in small quantities, making the amount of lactose you’re consuming even less. If you’ve been diagnosed with lactose intolerance and develop symptoms after eating feta, stop eating it and talk with your doctor. Although the cheese is easier to digest than other dairy products, if you’re severely lactose intolerant you can still develop symptoms. Symptoms typically develop with 20 to 30 minutes after you eat the cheese. You will develop stomach pain, cramping, diarrhea, gas and bloating. Lactose intolerance will cause your stools to float and they will be foul-smelling. There is no cure for lactose intolerance, but you still can eat dairy products with the use of a lactase enzyme supplement. Lactase supplements are available at a pharmacy without a prescription. Take the supplement right before your first bite of feta to prevent symptoms. Talk with your doctor before taking this medication.